Tracy's Notebook of Style: Target Beauty Box: $10 for 10 items ($50 value!) Available NOW! 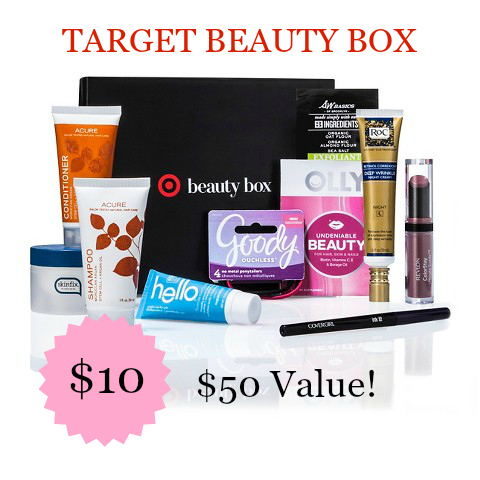 Target Beauty Box: $10 for 10 items ($50 value!) Available NOW! Monday mornings always get better when Target launches yet another beauty box. This one includes 10 items for $10 with free shipping plus an extra 5% off for REDcard holders. Thanks to The Fashion Palate for the heads up! Grab yours before they sell out. Luxuriate in a super-rich formula that quenches dry skin. This dye-free, sugar-free paste safely polishes your teeth and freshens your breath. An expert blend of antioxidants, vitamins, minerals and collagen that promotes healthy eyes, skin & hair. This natural mascara formula creates length and volume for luscious lashes. Restore your hair with the help of organic argan oil, which provides moisture to even the most damaged hair leaving it soft and manageable. These must-have elastics are made without metal for reduced snags and pulls. Create instant drama with this intense black formula that glides on smoothly and dries quickly. Its velvety-soft formula moisturizes with shea butter and aloe for color that lasts. This non-greasy eye cream is especially formulated to help even out dark circles and reduce puffiness. Get gentle exfoliation & deep hydration made from 3 simple ingredients: sugar, coconut oil and shredded coconut. Wow, that's such a great box, especially for $10!! Another reason I miss Target! See 40+ Homegoods New Arrivals Store Pics!! Currently Craving: Fall Layers under $30 + Sales! DEAL ALERT: Old Navy Puffer Vest $15 TODAY ONLY!! Target L'oreal $5 October Beauty Box is Here!